It seems to be business as usual in the worldwide “war on terror”. The United States military is currently embroiled in many hotspots where violence, fear, and the ever present reality or threat of high explosive are the order of the day. Those conditions mean, for people at the sharp end, multiple distress. But for suppliers of weapons and military equipment, the good times – which never really went away – are back. Consider, for a moment, just a few of the international conflicts stretching from Africa to east Asia where the US is a major player. It is increasing the use of armed drones in Syria as the war against ISIS accelerates. It remains active in Iraq’s evolving combat. Its military chiefs are working out how to persuade Trump to expand operations in Afghanistan, even as a resurgent Taliban tell him in an open letter to withdraw all American forces from the country. It is also about to conduct a major “wargame” in South Korea, where Trump and his ally, Japan’s prime minister Shinzo Abe, seek to counter North Korea’s missile ambitions. It is providing heavy military assistance to the Philippines government as a much less comfortable ally, Rodrigo Duterte, takes on a local ISIS-affiliated movement in the southern city of Marawi. It is called on to deploy more resources in eastern Europe in face of Russia’s power, and to address the rise in paramilitary violence in the Sahel. Such wars and rumours of wars require constant supplies, and this is where that perennial of human activity, the arms bazaar, comes in. The informative journal Defense News sums it up neatly with a report on military industries under the headline “A return to prosperity? Defense revenues climb for the first time in 5 years”. Even from such bare details, several important truths can be extracted or inferred. The first is the American dominance of the field, which is even more pronounced in that much of BAE Systems’s revenue comes from the company’s US-based activities. This leads to a second point, that all seven are transnational to varying extents. Airbus, for example, is active across western Europe, which allows it to use its clout with more governments. A third element is that these are very large outfits. Lockheed and Boeing each has annual military revenues larger than the entire GDP of Uganda, whose population is 39 million. A fourth point is that this sheer wealth enables huge operations. These are often aided by the “revolving door” whereby senior civil servants and military chiefs who are concerned in any way with weapons development and procurement can secure very good post-retirement consultancies or even board memberships. A fifth factor is that these companies, where their activity in relation to international arms sales is concerned, can rely on a favourable attitude from the states where their production is based. This positive outlook may extend to direct government encouragement and aid. 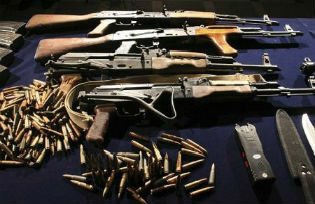 A clear indication is a ruling which found against the Campaign Against Arms Trade (CAAT). The group had challenged the legality of the UK government’s arms sales to Saudi Arabia, where weaponry exported to Riyadh were being used in repeated bombing of targets in Yemen that had caused substantial loss of life among civilians. A sixth and yet larger truth emerges, as obvious as the others yet all too frequently ignored. Major military companies actually need wars – or at least, they need very high states of tension and fear, of the kind which will guarantee increased sales potential. The ideal in such situations, whatever the company’s apparent national status, is to sell to both sides. Just before Nato’s air-war against the Gaddafi regime in 2011, for example, French and Italian arms companies were working for the Libyan government to upgrade its aircraft and armoured vehicles. Within days these were being destroyed by Nato forces, bringing a potential double benefit: supplying Nato states with more bombs and missiles to replace those used, and replenishing the Libyan hardware after the war. In this case, only the first part worked out well, for Libya came apart at the seams and its arms market has not so far been open to the big company deals of the good old days. But there are compensations: the condition of Libya, with its radical Islamist groups, migration pressures and other insecurities all make for an atmosphere of tension and fear. This is felt sharply across the Mediterranean, which improves the chances of higher military budgets in European states looking to protect themselves from the fruits of their own policies (see “Libya: victory, tragedy, legacy“, 3 November 2011). Shakespeare’s line in Henry V, “now thrive the armourers”, relates to the battle of Agincourt in 1415. But it is ever topical, and in more ways than one: for armourers also thrive by flinging accusations of lack of patriotism against people who question their operations, connections, and practical consequences. The biggest difference today is scale. These huge conglomerates are protected by their colossal turnovers, formidable power, and absolute belief in the legitimacy of what they do. It will take a great deal to change this culture. A single example makes the point. Two of the three largest military corporations, Lockheed and BAE Systems, sponsor Britain’s annual Red Poppy Appeal run by the British Legion (see “Red poppies and the arms trade“, 12 November 2014). Thus an organisation dedicated to helping the casualties of war and their families actually gets financial support from companies making money out of producing and selling weapons. Such stark contradictions need to be aired, as a step on the road to being able to say “now thrive the peacemakers”.